According to “THE ELEMENTS OF STYLE” encyclopedia as late as 1625 the downstairs of most European houses didn’t possess a wooden floor. The upper levels of houses would have a basic wooden floor but only if you were affluent enough to afford one. Wooden floors became popular during the Baroque Era (1625 -1714) they were regarded as elegant and stylish and came in the French parquetry and marquetry designs, however again these floors were only found in the most affluent and Royal homes. Early floor sanding of these floors took place using a different method; the wooden floors were scrubbed with sand, stained and polished. In the early 19th century more parquet floors were showing up, but again only in the richest of homes. Normal households would have the Wooden plank boards , these were often painted, in the better off households people would have tongued and grooved boards and these would go through a basic sanding regime to level and smooth the floor and would be polished to achieve a shine. Through the years of fitted carpets and linoleum, wooden floors lost some of their popularity, again except in the grander houses, however through the passage of time, wooden floors have become trendy all over again, and at very affordable prices, we no longer have to be rich and famous to afford beautiful wooden floors. wood floors are very pleasant and naturally warm. Wood is a great insulator that keeps the heat inside; therefore they keep your rooms warm. wooden floors come with durable finishes and are very easy to maintain. Since solid wood is hard the longevity of your wooden floors is naturally long lasting. wood floors are very easy to clean and maintain. There’s no need to scrub them over and over again. Sweeping and mopping will ensure they stay clean, with the correct maintenance products to keep them looking their best. Carpets in the home (breeding grounds for dust mites, mold and mildew, all of which affect people with allergies) wood floors don’t give pollen, animal hair, mold etc any where to hide and thrive.unlike carpets where they can embed themselves into the thick pile, even with steam cleaning, it is impossible to get the carpets completely clean, and getting them damp only adds to the problem. With wooden floors you do not need carpets so therefore the risks of allergies is greatly reduced. If you are lucky enough to have wood floor, that you could have found hiding under a carpet, you may wish to restore them back to their former glory. Nothing can compare to the look and feel of a beautifully restored wooden floor which has gone through a quality floor sanding process. Sanding and sealing a wooden floor is a job where it is very important that it is done well, but very easy to do badly. For efficiency and cost effectiveness, a professional floor sanding and Restoration Company like Williams Floor Restoration, with years of experience sanding all types of wooden floors will give you that extra peace of mind and ensure your floors are brought back to their natural beauty and keep their good looks for years to come. Sanding wooden floors is a great way to completely transform a house. We check all the boards, fixing any that are loose. Old tacks and nails are removed, while protruding nails are hammered flat. All damaged boards beyond minor repair will be replaced using reclaimed timber of the same quality and age wherever possible. Following the repairs to the floor the sanding and sealing process can take place. Step One : The first stage of the floor sanding process is to secure any loose floor boards and replace any split or damage boards or parquet blocks with reclaimed boards. At this stage our customers may want a hearth removed and floor boards etc replaced. Step 2 :The 2nd stage is sanding your floor, we go through a series of 5 stages with the floor sanding, beginning with a course grit paper through medium grit, finishing with a fine sand paper to ensure a smooth finish. Gap filling will take place between the sanding stages. Step 3 :(Optional) Staining can bring wonderful depth and warmth to the wood floor. Staining your floor can bring warm, rich tones to a room floor .If you visit your local DIY shop, a lot of the floor varnishes on offer have a colour included, such as teak or oak. The only real advantage of this is basically time and convenience during application. The disadvantage is that, with each coat you apply, the colour changes and darkens. You are guessing what the final appearance will be. Most importantly, as a coloured varnish wears with time and traffic, the colour starts to be affected immediately. With our process, the seal is protecting both the wood and the colour stain, ensuring that the stain remains consistent for far, far longer. When we get to the staining stage, we can test patch different coloured stains to a small section of the floor for you to choose from. We simply sand the test patches off once you have decided and apply the colour of choice. Step 4 :Sealing your floor, whether or not your floor has been stained it will now be ready for sealing, we apply hard wearing durable sealants, in a variety of finishes ,satin, matt and gloss,. The first coat is applied then lightly sanded back using a very fine sanding paper to de nib the floor, a further two coats of sealant are then applied to complete the restoration. 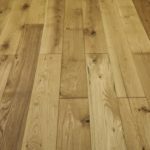 Wether your floor is Hardwood or softwood, a solid wooden floor is an investment which will appreciate over time, and irrespective of whether it’s your home or office, we are confident that if you have a wooden floor, you will want to look after it to keep it looking at it’s very best. Estate agents statistics show that properties which have well maintained real wood floors rather than laminates and carpets usually demand a higher price, in fact some home owners decide to have their floors sanded prior to advertising their property for sale, to attract a higher price. Floor sanding brings out the natural beauty of a wooden floor. No matter how it may look now, we will be able restore your floor back to its former glory. People often wonder if perhaps their boards are in too bad a condition to be renovated by floor sanding , In our experience, we have as yet not come across a wooden floor which cannot be restored and its natural beauty brought back to life . If necessary, we replace any missing rotten or split boards with reclaimed boards so that they blend in with the existing wooden flooring, and of course recycle old boards rather than chop down more trees. After the floor sanding and sealing process they look better than new floors because of the beauty that only old wooden flooring can give. When a floor is not too badly worn, the floor can be revived by thoroughly deep cleaning, buffing and resealing, this freshens up the wood floor and brings the floor back to life without the sanding process. As professional floor sanding specialists, with over 25 years experience we understand how important using top quality equipment is, we use the new generation “Continuous Belt” floor sanding machines by Clarkes and Bona. Beware of any company still using old drum sanders which create a lot of dust and can damage your floor if not used correctly. The latest floor sanding machines we use are virtually dust free due to their powerful suction and large dust collection bags. Wood floor sanding is needed in every property which has wooden floors ,this not only improves the look of the room but also makes maintenance easier. A wood floor which has been sanded well will complement any decor and makes the interiors look luxurious. A well kept floor commands more respect than one that is laminated or carpeted. Whether you have a hardwood or a softwood floor, sanding will help bring out the best. Why choose a good floor restoration company? Choosing the right floor restorer to sand your floors is very important. A floor sander who has the newest technology should be chosen. The more recent developments in technology have brought machines which collect the duct by suction. This reduces the dust considerably and makes the after-job cleaning much easier. One of the main reasons why some wood flooring becomes prematurely aged is due to warping and rot which sets in due to an excess of water on the floor. Wether this is caused by a leaking radiator or liquids and spillages being allowed to lie on the flooror by using too much water when cleaning the floor, water damage can mean an early death to floor boards and prolonged water damage will certainly mean replacing damaged boards, so to prevent this wipeup spillages immediatley, use very little water when cleaning your wood flooring, and after cleaning , use a dry mopto dry up any moisture. • Wooden floors require nothing more than sweeping or vacuuming and a very light mop . .Vacuum or dust- 2 to3 times a week to minimize the damage which can be caused by dirt, sand, and grit, which can scratch and dull the surface of the floors). The use of a soft brush with fine, exposed bristles will help trap and remove grit. • When vacuuming, use a brush attachment, since beater bars can damage the floor’s surface. • It is recommended to lightly damp-mop the floor (Too much water may cause the floor to swell, warp or discolour) using a dilute mixture of wood cleaner and water to remove spills and foot tracks. General household cleaners may abrade and dull the floors finish. Steam mops are not recommended as the heat of the steam can break down the lacquers protecting the wood , and the steam is adding unnecessary moisture. Keeping your wooden floors looking lovely is not difficult, but these few useful tips can help homeowners to become even more successful at taking care of them and add years to their life.The first areas to show signs of wear are the high traffic areas , such as hallways and the entrace to a room, this can be prevented by using some simple tricks.When woood floors wear excessively in these high traffic areas it is often because people are walking around in shoes with grit embedded in them, which scratches the floor, one sure fix for this problem is to adopt a “no shoes in the house rule”it definitely works. In commercial properties such as offices, schools , restaurants etc.this is not practical so in these places dirt trapping mats are the best option to prevent the grit reaching the timber floors. • Floors in high-traffic areas may need to be re sealed every 3 to 5 years. This involves deep cleaning and meshing back the old surface before applying fresh coats of floor sealant , this will minimise the need to re sand the floors too regularly and prolong the good looks of the wood. Ways to immediately begin preserving the newly sanded floors include placing breathable mats at all room entrances to help catch dirt, keeping the claws of any pets you may have nicely trimmed so that they will not cause any scratches or other damage, using felt pads underneath the legs of any pieces of furniture that are positioned on the wood flooring, avoid dragging furniture across the floor use the lift and place method where possible and avoiding walking on the floor with footwear such as damaged heals, spiked high heels or athletic cleats. Other good tips to help preserve the looks of your wooden floors include installing blinds or curtains in rooms where the flooring is present in order to prevent fading due to ultraviolet light,. and placing area rugs in places where there is particularly heavy traffic such as in front of sinks and at stair landings. 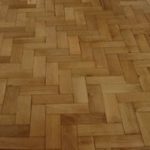 Parquet floors are very beautiful and add a charming feature to any home, they come in an array of exquisite patterns for example herringbone, square basket, chevron to name but a few and if they are correctly maintained, they can really enhance your home. Like all other types of wood floors, parquet will require sanding from time to time, and should only done when necessary, this should be carried out by Floor sanding professionals with good equipment, as over sanding will reduce the life of your parquet floor, choosing the correct finish is also important, ensuring that the varnish used is compliant with the surface. • Avoid moving furniture around on the floor. Place felt pads on the bottom of furniture; this reduces the amount of scratching the floor undergoes. • If a localized area of the parquet blocks gets damaged rectify this immediately to protect the floor from further damage. • Follow the maintenance advice issued from your floor sanding professional and only use the cleaning materials recommended for parquet floors. • Use mops, soft brushes and other accessories which will not scratch the surface. Dust free floor sanding. Often when people look at their wooden floors and realize they need the services of a floor sanding company to restore them back to their former glory, they can be reluctant to pick up the phone, simply because they have concerns about the amount of dust that sanding their wooden floors may cause. 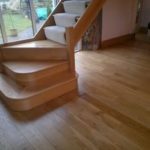 Customers can be reassured that they do not have to continue living with wood floors that are scratched , dull and worn .New technology can now produce dust free floor sanding a much cleaner way, for customers to bring the natural beauty of their wooden floors back to life in a safe environment. imperfection free results, the Floor Crafter is a truly unique and innovative approach to hardwood floor sanding. Are you looking for a beautiful “New England “look for your wooden floors? then Lime washing may be a perfect finish for you. Though this technique that has been used for many years, our customers rarely know what lime washing does, and how it can bring a unique beauty to the wooden floors in their homes ,this method of using a combination of calcium hydroxide and chalk to achieve a bleached wood effect whilst still being able to see the wood grain, is very effective, with the added benefit, that in the last few years , lime wash products have been made available in variety of soft pale colours, giving customers a wider choice to match their colour scheme .Lime washed wood, can transform any room into a light, bright, beautiful living space, which will enhance the opulence and character of many homes .